Welcome to Beautiful, Historic Skippack Village! Skippack is a beautiful, classic American small-town located in the heart of Montgomery County, Pennsylvania. Offering a vibrant selection of boutique retail shopping, services and 5-star dining, the classic look and feel of historic Skippack Village has something for everyone! Discover the magic of Skippack Village: from our fun and festive 1st Fridays, to our signature Skippack Days celebration, classic car shows, wine festivals, unique shops, award-winning restaurants, outdoor activities, vibrant live music scene, outstanding community theater, amazing history, beautifully restored buildings, fine art, and terrific people! All Skippack shops and restaurants are locally owned and operated. When you visit a local shop, there is a good chance you will meet the owner. We are a real American small town where people know one another, each individual matters, and everyone who visits is welcomed! Discover the best faux florals and greens right here in the heart of Skippack. Jacque’s located right across from The Wooden Duck opened its doors October 2017. Offering seasonal stems, succulents, greens, wreaths, arrangements, candles, gifts and antiques. As a floral designer my favorite part of the job is working with my customers to create a beautiful arrangement or wreath that will be timeless. Le Butler’s Pantry is located in the center of the shopping district in Skippack Village, on Rte 73. We are a gourmet kitchen supply store with something for the beginner cooks or bakers as well as the seasoned chefs! We offer a wide variety of gadgets to make cooking easy and fun. It is our goal to make your shopping experience truly enjoyable! Playcrafters is a 70-year-old community theatre (all unpaid roles). The group is located in the iconic red barn right in the center of Skippack Village. In its intimate 115 seat, thrust stage performing space, the group performs 6 plays each season. The standard season includes at least 1 musical, 1 drama, 1 comedy, 1 Avant-garde/thriller/mystery/classic, with the remaining 2 productions coming from all the other categories. These are chosen to challenge both the actors and our audiences. Let’s start with our name... We are often asked why cabbage? Our idea was to make healthy salads to take to parties, potlucks and cookouts. Why? Because many people don’t have the time or energy to spend cooking, and supermarket offerings are sub-par. We wanted our ingredients to be readily available, healthy, nourishing, and delicious. Cabbage fits those criteria. Cabbage represents our ideas, recipes and mission. We offer more than salad, but the name still fits. Visit Our Beautiful Shopping District! A unique, boutique, retail paradise! 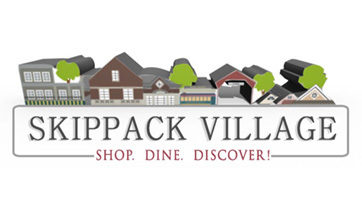 Discover the Taste of Skippack Village!